No rest for the weary! From conquering the picturesque Monte Carlo for the ninth time, World No. 5 Rafael Nadal is back at home in Barcelona to try and capture a record-extending ninth title at the Catalan capital. Perhaps that is what makes the tennis season more exciting as every week brings new hope for the fans and sets new challenges for the players. For Rafa, it is a stern test for his mental fortitude and confidence as he looks forward to laying his hands on silverware for the second week in a row. That is something he failed to do for the last two years as his form suffered undesirable fluctuations from week to week. At Monaco, he looked to have put behind his recent ordeals and struck his forehands with ferocity like he used to do earlier. With an encouraging four top-20 wins at the Principality, the 14-time Grand Slam champion should be eager to continue his winning spree and set an early marker for his 10th French Open title. The task is not an easy one, though. 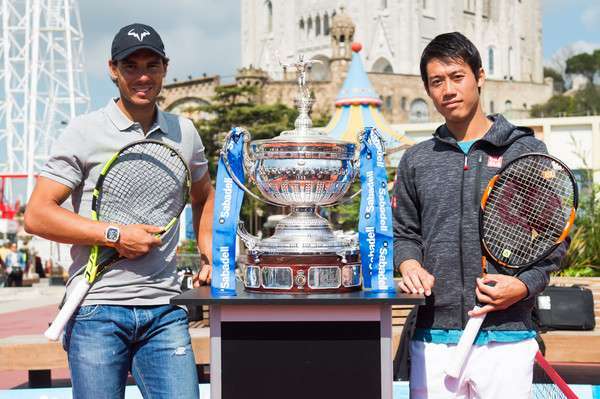 For the singles draw at the Barcelona Open Banc Sabadell is riddled with dangers such as defending champion Kei Nishikori, Richard Gasquet, Benoit Paire and a host of Spaniards that includes four-time runner-up David Ferrer, Feliciano Lopez and Roberto Bautista Agut. Apart from that, there are also a few players who have troubled Rafa in the recent past such as Fabio Fognini, Alexandr Dolgopolov, and Alexander Zverev. Being top-seeded, the 29-year-old can have a brief respite as he has a first-round bye. His draw till the quarter-final looks pretty comfortable but he needs to be careful in his opening round as Marcel Granollers – his likely second round rival – reached the last-eight in Monaco. After a third round meeting with the 14th seeded Portuguese Joao Sousa, Rafa will be mostly locking horns with his 2015 conqueror Fognini or eighth seed Viktor Troicki in the quarter-finals. Nadal has defeated both of them in their last meetings though the 12th seeded Italian can pose a threat with his array of pacy backhands and movement. David Ferrer, seeded third, leads the second quarter of the draw and can cross swords with his illustrious compatriot in the semi-finals. The 34-year-old has lost each of his four finals to Nadal at this venue and Rafa should pass this test more easily than usual as doubts hover over the 2013 French Open runner-up’s form. One of the game’s most persistent performers might have his challenge enfeebled after falling victim to a recent spate of injuries. With a lacklustre 12-7 record this season, the World No. 8 might be a pale shadow of himself this week. Ferrer, though, has to first encounter seventh seed Feliciano Lopez in the last-eight clash, who has not beaten him since 2009 even though their matches have been very close. Kei Nishikori, seeded second, heads the bottom half of the draw and is looking to register a hat-trick of titles at the Real Club de Tenis Barcelona. 13th seed Jeremy Chardy can prove to be a feisty competitor in the third round for the 2014 US Open runner-up. The Frenchman lost to Bautista Agut at Monaco in a thrilling second round match and can make it tough for the Japanese in his first tournament of the clay season. Fifth seed Bautista Agut, who won two rounds at Monaco, can be Nishikori’s potential quarter-final opponent; although the Spaniard has to overcome the lethal 11th seed Dolgopolov first. It is difficult to pick who might face the Japanese in the last-four stage as the third quarter of the draw looks absolutely loaded with quite a few talents. Fourth seed Gasquet is the highest seed from that section and has to contend with the likes of youngster Zverev in the third round and the Rio Open titlist Pablo Cuevas or sixth seed Benoit Paire in the quarter-finals. If Nishikori wants to reach another Barcelona final, he needs to ensure that he is at his very best as each of these players can turn out to be very tricky on clay. Paire was just two points away from toppling Andy Murray in the Round of 16 last week while Cuevas too can be quite menacing on the red dirt, having won all his five ATP titles on this surface.